Operating heavy equipment is a skill. The best that I've observed perform real artistry. Crane operators are among the best I've seen, and even worked with a few times on tower jobs. At the other end of the spectrum there are those who are not at all artful, and can even be a danger to life and property, even to themselves and the equipment. Operators of small machinery cover a wide spectrum of ability and care. In particular I am thinking of backhoes and front-end loaders. Too often they are under tremendous time pressure by those hiring them and the equipment they're operating. Time is money after all. Slow careful work is appreciated though not with money when the job time stretches beyond budget. Operators are pressured by both the client and their employer to get the job done quickly and adequately, then get out of there and on to the next job site. Standing amateur radio towers are given a wide berth just as for any permanent structure. 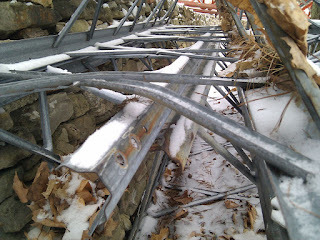 Damage to a structure is always expensive to all concerned and likely a career limiting move for the backhoe operator. Tower sections stored on the ground are another matter. To the unschooled eye they can look like any other pile of refuse, just some scrap metal littering the job site. In the rush to get the job completed these stored towers are at considerable risk of an accidental contact. When that happens the tower always loses. Last week I had such an incident. This is especially galling for two reasons. One is that I am well aware of this attraction between towers and backhoes, and I have a lot of tower stored here. The other is that I spoke to the project manager beforehand, pointed at the stacked DMX tower sections and asked him to take care not to damage them. Although old and not in perfect condition I have plans for this tower. He assured me all would be well. After all they were at least 6 meters from the excavations side, up against the stone wall and behind two fairly large spruce trees. It wasn't far enough. I should have known better. Luckily I had moved the more valuable LR20 tower sections much further away, so they were far more safe from an accident. The project manager is not a fool nor is he careless. However he was in a rush to get the job done since his customer (me!) was getting increasingly irritated at the many delays getting the work underway. When the backhoe his company rented, and which he operated, wasn't large enough to easily penetrate the now frozen ground (because of the delay getting started) he called in a larger machine and operator to complete the excavation. As you might guess that's when the accident occurred. In the fast two hours it took to complete the excavation some of the debris he was piling up tumbled down the far side, between the trees and into the stored tower. No one at the time noticed what had happened. Frozen soil broken up by the backhoe is really a bunch of large oblong boulders. If it was just granular dirt nothing untoward would have occurred. When a 50 to 100 kg boulder rolls down a slope into a pile of steel something is going to give. Promises are not to be relied upon. No one was being careless. Everyone was simply trying to keep the cost down and make me happy. I was not happy when I discovered what had happened two days later. Once I realized what had occurred I made a phone call and at least got that complaint off my chest. Then I began the task of removing the partially buried tower sections. 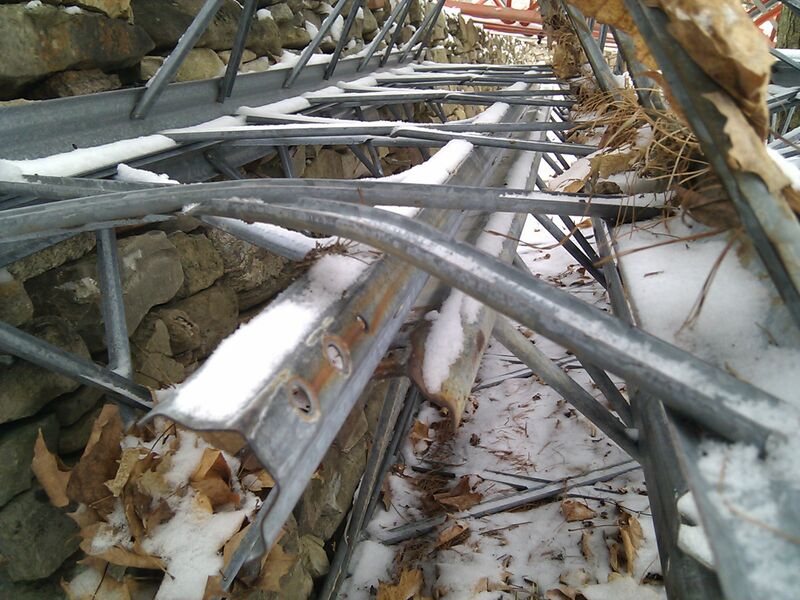 The ones at the bottom were frozen to the ground and had to be pried loose for removal and inspection. I was lucky. Only one section was damaged and it is damage that I believe can be repaired. Although this is not expensive tower to replace it is inconvenient and time consuming to locate and acquire. This is not the first time I've had tower damaged by a backhoe. When I had a house built for me many years ago I stored my 64' tower at the very back edge of my property where even grading work would not take place. Yet a backhoe found it. My contractor apologized and took responsibility for the actions of his subcontractor. He did point out, however, I ought to have moved it off the site entirely. We agreed on a mutually acceptable settlement that didn't involve money changing hands. I really should have stored it on my neighbour's property. Last summer I acquired 6 sections of Trylon tower essentially for free. The reason was, as you might guess, backhoe damage. The ham selling it realized after close inspection he could not demand any price without extensive repairs. These became the top two-thirds of the tower I recently put up. I took it off his hands as part of a larger deal and undertook repairs at my own expense and time. I knew what I was getting into since I've done this before. Several components could not be saved and had to be replaced. Others I was able to repair with some careful assessment by me and, by photograph, with an engineer. 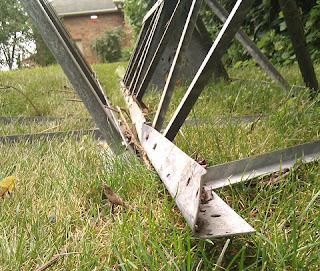 Most of the damage was repairable by disassembly, bending steel and then reassembly and alignment. I have a future article planned on this very subject of tower damage and repair. It may even get written eventually when I find the enthusiasm to do so. However, unless you are up to it I recommend replacing not repairing damaged towers. Considering the unavoidable attraction between towers and backhoes this is a not uncommon dilemma faced by many hams. In fact I suggest you closely inspect any used tower you are planning to buy for damage, not only backhoe damage. Prevention still remains the best cure for this problem. If you must store a tower where heavy equipment is present you know what to do.